Open that refrigerator door and witness the good, the bad and the little bit ugly. I am referring to those jars and bottles and otherwise smallish containers of sauces, toppings, dressings, jams, jellies, and whatnots that fill the side doors of your largest kitchen appliance. Go ahead and open your door and see what’s in there. Then, come along and see how they stack up. 1. Condiments count. The calories in them count just like other calories in other foods you may be counting. Depending on how much you spoon on, they can add up. At the same time, the nutrients in them add up, too. 2. 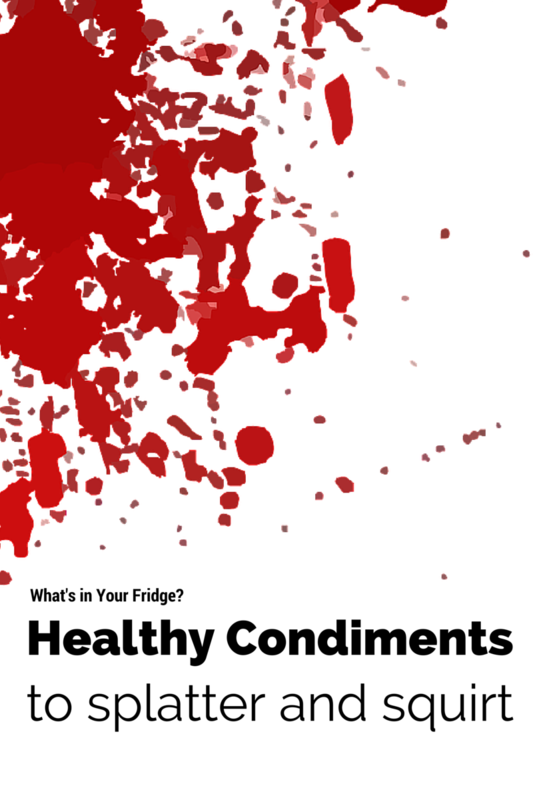 Condiments can boost health in an indirect way. Although some condiments have lots of healthy goodness, in general, they are not classified as a superfood. They can certainly make foods that are already nutrient-dense taste even more flavorful, though, and therefore causing one to eat MORE of that superfood. How’s that for a strategy with picky eaters? WHAT IS THE THOSE JARS AND BOTTLES OF CONDIMENTS? 1. Let’s start with America’s darling: ketchup. We squirt it on just about anything. And, that could be a good thing. It is a good source of lycopene, a carotenoid that may help slow the process that leads to atherosclerosis. It also protects against certain cancers, cardiovascular disease, and macular degeneration, too. Some brands can be higher in sugar so check labels for that. This study says you may want to reach for the organic ketchup as it contains up to 60 percent more lycopene than conventional brands and had the highest levels of vitamins A, C, and E, too. 2. Both salsa and cocktail sauce are other great tomato-based condiments. They are low cal and low fat and can be a great sub for the fatter choices like mayonnaise and dips. Like ketchup, they contain lycopene and all its health benefits described above. Making your own salsa is best as the store-bought can be high in sodium. 3. Okay, so this condiment is not stored in the refrigerator doors. (In fact, is it actually a condiment?) But all that aside, I had to mention one of my favorite flavor enhancers: vinegar. They are a cooking game changer indeed, and one of my favorite choices to add a splash to my soups and stews – not just my salad dressings. I am embarrassed to say how many various bottles I have and like a mother and her children, I can’t admit a favorite. Did you know that vinegar holds claims on some health benefits, too? Click on over here for more on that. 4. Cut you appetite with hot sauce. The capsaicin in it may be responsible for that as well as proving to be a possible pain reliever. It’s low cal and can give a kick to otherwise bland dishes. Cool it down with some Greek yogurt if you must and it’s great to add to greens like these of all kinds. 5. Many have a special homemade sauce they love. I do, too! It’s a beautiful shade of green and so versatile. I use as a condiment a lot when I have it around. Everyone loves it and it’s great with so much and full of such good stuff for you. Click on over here to whip this up in a snap if you wish. It’s a great way to use up those big bunches of parsley and cilantro you forgot about in the back of the fridge. 6. Horseradish is in the healthy condiment in the cruciferous family and abundant in the currently studied possible anti-cancer compound glucosinolates. This compound may increase your liver’s ability to detoxify carcinogens and may suppress the growth of existing tumors. It’s powerful stuff so go slow or stir it in your dish with other ingredients to temper the kick. Use it in a sandwich or wrap, a salad dressing, and even in scrambled eggs and salsa. 7. Who doesn’t love a jar of homemade jam or jelly? A tablespoon can really add a lot to a barbeque sauce or pan sauce. We can’t always have homemade, but look for ones made with fresh fruit (organic even better!). Low-sugar versions are a much wiser choice. 8. Here is another non-refrigerator item, but one I want to mention. Most of us have vanilla extract in our pantry, but lemon, coconut, maple, mint and many others can add calorie-free flavor to foods, too. Strangely enough, I find when I add them to my smoothies, a sweetness seems to come out. You may want to give a drop to steel-cut oats, plain yogurt, sauces and toppings, too. 9. Fermented foods and their digestive benefits are a hot topic these days. Keep some sauerkraut in your fridge as it is full of probiotics that can help relieve some stomach distress and balance your system. Fresh is better and I see it every week at the farmers’ markets when I am there and it is superior tasting. Add it to your grilled foods, toss in a stir-fry, or like me, just eat it right out plain. 10. Mustard is a low cal option that packs in a lot of flavor and a nice bite. It comes in many variations from spicy to the more commonly used Dijon. Mustard seed is known to help with various skin conditions as well contain many helpful minerals and vitamins. (More here on that.) I reach for it often to add that extra zing to my sauces, marinades, and dressings. It can be high in sodium, though, so look out for that. There are plenty more condiments and favorites from all over the world. Do you have one you reach for often and do you know if it has health benefits as well? Making better choices at the grocery store is crucial to eating healthy. Here’s specific information on all those confusing food labels to make that shopping a whole lot easier. While on the topic of cooking, here are some tips on some things you may want to reconsider in the kitchen. A true flavor enhancer they are! I love them, too, and always want to try the new ones as well. Everyone has their favorites. I love them all! Thanks for commenting, as always. This is great information! I will have to start taking a look at organic ketchup to get the most nutrients! My boyfriend loves making his own salsa. And I've fallen in love with all kinds of mustards over the years. The new mustard combinations are interesting! Yes, look for organic ketchup if you can. Thanks so much for stopping by! I make my own ketchup and BBQ sauce and I put my homemade hot sauce on pretty much everything! Those all sound good! Then you can spice it up just the way you like it and no preservatives! Good for you, Dannii! Glad it is helpful to you! You are a busy bee, so I am sure that baby weight will peel off quickly! Best of luck with that, though! Thanks, Laura! I had fun writing it. I LOVE condiments of all kinds and always want to try anything new in that area. So interesting about Mr. Condiment and the hot sauce! Great of you to add in here! So I'm anti-condiment (I'm weird like that) and I'm married to Mr. Condiment and the children who love them as well! Ha. But I will say, I think when my husband pours Frank's Red Hot Sauce all over his food, it staves off his appetite and he eats less. He's also a big horseradish man but again I think it really helps him health wise ~ the guy never gets sick. Such an intriguing topic though!